Everhour is an intuitive and straightforward time tracking software that offers a comprehensive feature set that addresses all your time tracking needs. It is an ideal solution for companies and organizations that want to be on top of their time without having to exit their favorite management environment. Everhour works well with numerous team management platforms, including Asana, Basecamp, Pivotal, Trello, and GitHub while the software is constantly developed to integrate with more solutions soon. Aside from tracking time, Everhour also offers task and project management capabilities as well as basic and advanced reporting functions. With Everhour, you don’t only track time, you can also delegate tasks, monitor the progress of your projects, and generate the reports that have the information you want and need. 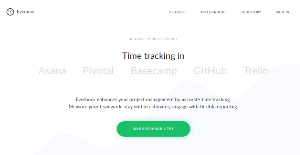 Everhour is designed to function seamlessly within our favorite project management platforms such as Asana, Basecamp, Pivotal, Trello, and GitHub (with more options to come in the near future). With the system in place, Everhour effectively eliminates the need to deploy two apps simultaneously as you have a solution that has time tracking and task management capabilities. Everhour can be easily introduced directly into your existing projects in your Project Management system. You need to be really precise (or close) with your project estimates. Everhour ensures that you are with your tasks and your team members. You can monitor the progress of all your projects as well as the tasks of each team member right next to the task titles.The software helps you become aware of the overall team progress with just at a glance at the tasks list. Everhour’s reporting tools are so flexible and customizable that you can easily make the reports look the way you want (add columns, change order, apply filters and formatting, etc.). With information coming from various aspects of your projects, such as tags, estimates, projects, milestones, you can dig deep into each task, analyze all the information, and have actionable insights that can guide you to perform better, deliver projects in time without having to go over your budget. For those who are always on the go, Everhour simplifies time tracking with a mobile responsive version that works well with the popular mobile operating systems and interfaces. What Problems Will Everhour Solve? You can stay on top of your time tracking and project management processes without changing existing PM-tool. Companies have unique needs and requirements and no software solution can be perfect in such a condition. It is useless to try to find a perfect out-of-the-box software product that fulfills all your business needs. The smart thing to do would be to adapt the solution for your unique wants, employee skill levels, budget, and other factors. For these reasons, do not hurry and pay for well-publicized leading applications. Though these may be widely used, they may not be the ideal fit for your unique wants. Do your research, check out each short-listed application in detail, read a few Everhour reviews, speak to the maker for clarifications, and finally settle for the product that offers what you want. How Much Does Everhour Cost? We realize that when you make a decision to buy Time Tracking Software it’s important not only to see how experts evaluate it in their reviews, but also to find out if the real people and companies that buy it are actually satisfied with the product. That’s why we’ve created our behavior-based Customer Satisfaction Algorithm™ that gathers customer reviews, comments and Everhour reviews across a wide range of social media sites. The data is then presented in an easy to digest form showing how many people had positive and negative experience with Everhour. With that information at hand you should be equipped to make an informed buying decision that you won’t regret. What are Everhour pricing details? What integrations are available for Everhour? If you need more information about Everhour or you simply have a question let us know what you need and we’ll forward your request directly to the vendor.